Ladies and gentlemen, may I present the ‘red velvet plums with pain perdu’. This is, for sure, a show stopper of a dessert. It could also be breakfast, or brunch, depending on your decadent hungry mood. 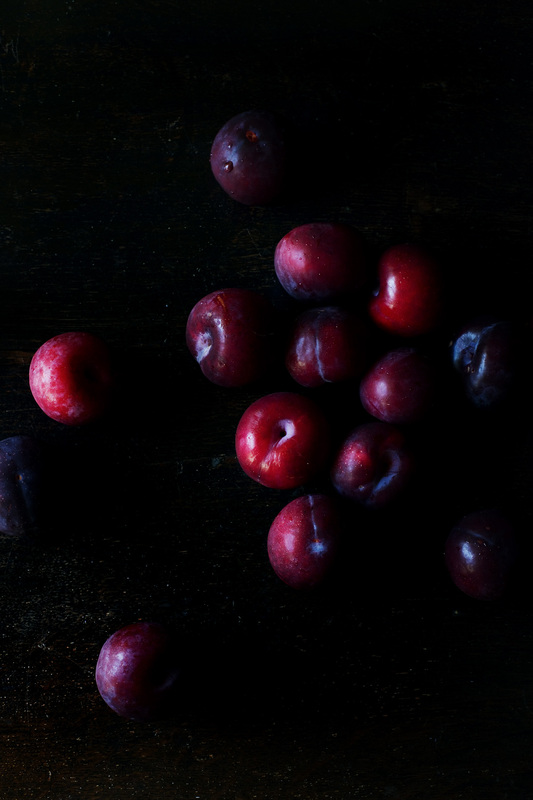 Inspired by the colours on my kitchen table, the plums were screaming ‘Think red!’. So there I was, seeing red on a plate, slowly adding some matching taste. Cinnamon, star anise, sugar and of course, some red wine. Themed like a cabaret show, with lots of heavy red velvet curtains and the whole spicy pizzazz. Served with a rustic pain perdu and you have a hit. Instead of having a dinner and a show, I thought of a drink and a show. The show being the plums and pain perdu. The drink is none other than ice-cold red wine mixed with sugar and crushed strawberries. It’s very good indeed. It’s definitely over-the-top to serve all this together, but isn’t that what a good show is all about? Pain perdu (French toast) is such a satisfying meal to make. It was called ‘lost bread’ because the bread was so old and stale that if it wasn’t cooked in this manner, it would have been lost. I used three-day old country bread, soaked in two eggs, milk and sugar. By only using two eggs, I find the ‘toasts’ to be lighter, airier and more to my taste. Slice plums in half (horizontally), remove the stones and place in a bowl. Pour the red wine and cover for one hour at room temperature. Drain the plums and save the red wine. In a saucepan, pour the saved red wine + 2 tbsp, add sugar, cinnamon stick, star anise and cook on a low heat until sugar has entirely dissolved. Turn the heat slightly higher and bring the mixture to a boil until it becomes syrupy. Lower heat again and add plums (flesh down). Stir occasionally and gently. Cook on a low heat for 10-15 minutes, depending on how ripe the plums are. Set aside. Mix sugar, egg and milk in a large bowl or deep dish and whisk ingredients together until slightly frothy. Soak bread slices on both sides (if bread is stale, soak 8 minutes of each sides, if bread is not stale, soak 4 minutes on each sides). Heat butter in a frying pan on a medium heat. Make sure not to over heat the butter. Add the bread by batches (depending on the size of your pan). Fry 2-3 minutes on each sides. Bread should be golden brown. 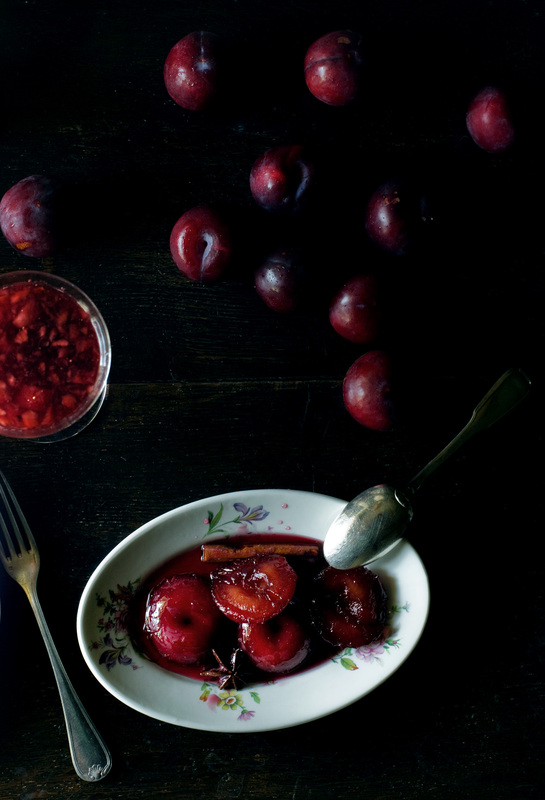 Serve pain perdu with the plums and syrup on top. Wash strawberries. Chop coarsely to very small cubes, or place in a food processor and mix for a few seconds. Place in a large jug, sprinkle with sugar and pour red wine. Mix gently. Leave to macerate in fridge for 1-2 hours. Mix gently before serving. Serve ice-cold. Don’t you just love plum season? Our tree is heavy with fruit now, and I could eat them forever. I’ve never used them in a syrup to douse pain perdu, though. It sounds amazing. What a wonderful way to use up the bounty of summer! And your strawberry wine – a lovey combination! Will have to surprise my family with it tonight! Cheers! 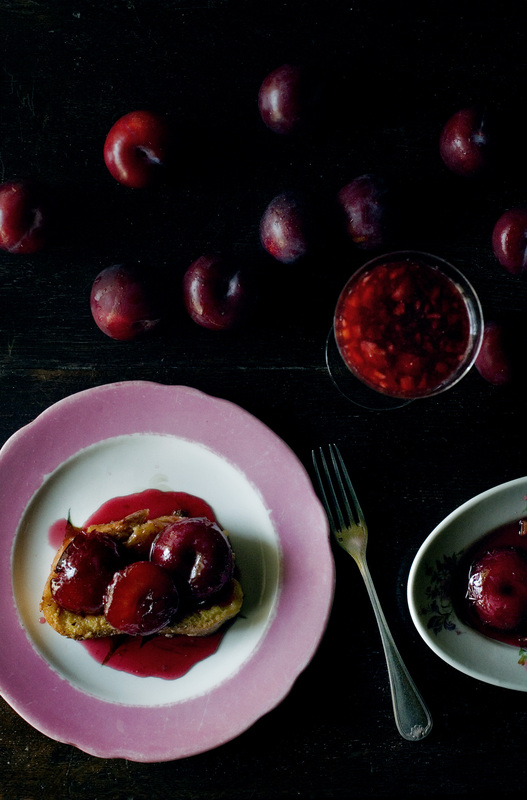 Pain perdu is one of my favourites, those beautiful red plums would make it extra special. This pain perdu brings me back to the smell of my grandfather making sweet-as-can-be french toast for me in the mornings with a hefty handful of saccharine figs on the side, but plums sound just divine as well. Thank you for bringing me back to my grandfather’s kitchen. Yum! 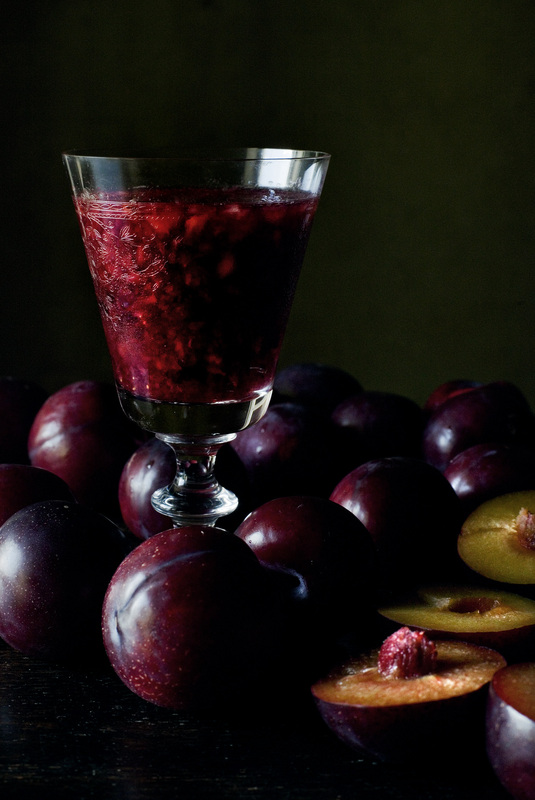 I adore plums and your photography is stunning. Gorgeous post and recipe! I have never heard of caster sugar until now. I’ll be seeking it out here in Brooklyn..very curious. Stunning blog you have here; I found you through Smitten Kitchen. I have never heard of caster sugar until today. I will seek it out here in Brooklyn…very curious. You have a stunning blog, life and family! Glad I found you through Smitten Kitchen’s recent post.